It’s happened in other states, and now it’s happening in Illinois. A shameful bill, which would force ‪‎transgender‬ students to use separate school facilities from their peers, has advanced to the Illinois House Human Services Committee. We need to stop it in its tracks! Sign the petition at the link below. We’ll deliver the petition to the legislators on the committee, which could take action on this bill in April, and to your representative. 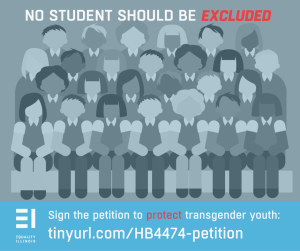 HB 4474 is an awful and harmful policy that would write discrimination into Illinois law and make schools less safe. Please sign the petition.